The team arrived Thursday with great excitement and anticipation as the new car was set to arrive on Friday morning, and the team had yet to see it. Friday morning, 30 minutes before daylight we met Justin Lambert of Cognito Motorsports to get a look at her. We were all thrilled the car was spectacular top to bottom- and complete with a brand new wrap. Justin went over some fine points with us and we started doing testing on Friday. George White of Double E Racing flew out to help us dial in the suspension, which we were able to do pretty quickly, and we pulled into tech and contingency. We were pretty surprised at the amount of people looking at the car — we were all extremely impressed with the build from Cognito and the graphics from Finishline signs. We made it through tech and contingency, and still had a few things to do to the car. The crew worked on it until 6-7 on Friday night. Saturday race day we got up early, went out to the pit area and set up. We were nervous being in a new car which we had only driven 5 or so miles and entering a 250 mile race. We had high hopes hoping everything was as it should be—and it was. When we left the starting line we came out of the chicane behind our competitor. We chased that first gentleman down in about 2 or 3 miles. That is when we realized we had an animal on our hands with this new car. It is truly a fierce competitor. In the first 20 miles we were able to run down 6 or 7 cars and make some passes, and putting us (on corrective time) with the top five cars. Unfortunately, we did not have the Lead Nav app set up correctly and we were therefore unaware of certain course dangers. We hit a washout at excessive speed almost crashing the car at about mile marker 20. After the event we found our brakes were extremely weak, and we suspected a problem with the right rear caliper or brake line. We continued along at a bit of a lesser pace for the remainder of the first 80 mile lap— picking of several more competitors. Upon entering the Parker Python at the end of the first lap, we heard a grinding noise. Fortunately we were able to limp the car right into the pits where our crew informed us that our right rear hub/bearing assembly sustained failure as a result of the earlier contact. 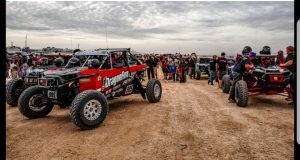 We were extremely fortunate to be able to borrow parts to make the repair from Cognito Motorsports— and we want to thank them for their generosity. Since Russell and Jimmy were going to change drivers, Russell jumped out to help with repairs as Jimmy prepared to take over the driving duties. Since the hub assembly damaged the caliper, all brakes on the right rear had to be removed and we had to block off the fluid. After roughly 25 minutes the repairs are completed and the car was dropped to the ground— running flawlessly from then on. 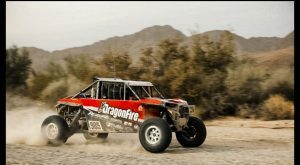 We are happy to find that our experience in the Pro Production Class is going to translate well into the Turbo Class- we can see that the Dragonfire team has the potential to be on the box this year. 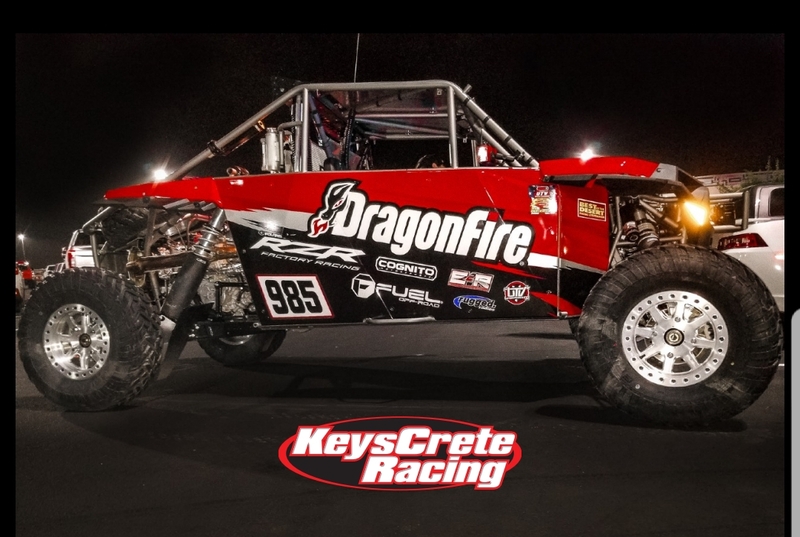 This entry was posted in UTV Racing and tagged in Cognito Motorsports, Double E Racing, Dragonfire Racing, Fuel Offroad, Keyscrete Racing, Polaris, Rugged Radios, Trail Armor.